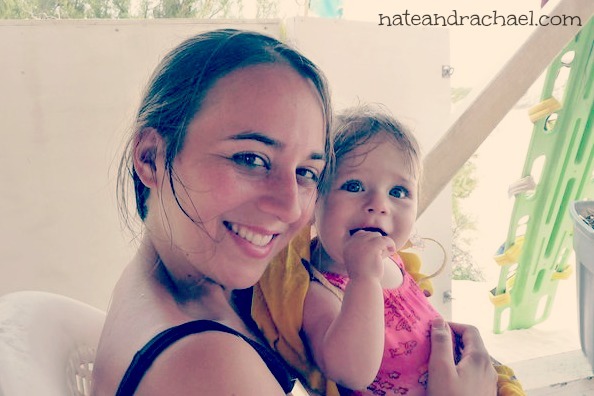 My all-time favorite post to write and share has been my “35+ Free Things to Do at the Beach with Toddlers and Young Kids“! And why not? Beach, family time, vacation, free fun–of course I loved it! But that post unfairly left out the littlest of travelers–babies. 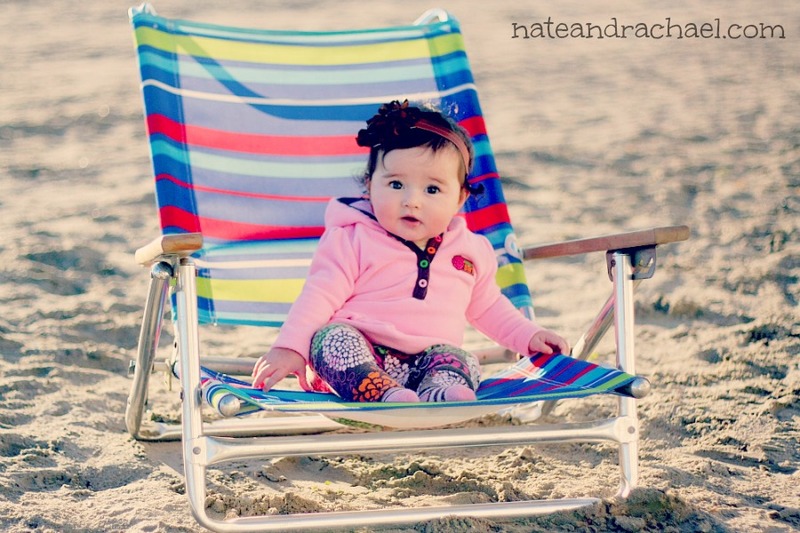 Babies should have fun at the beach, too! We live in a landlocked part of the country, so (unfortunately) we’re not able to visit the beach every weekend. 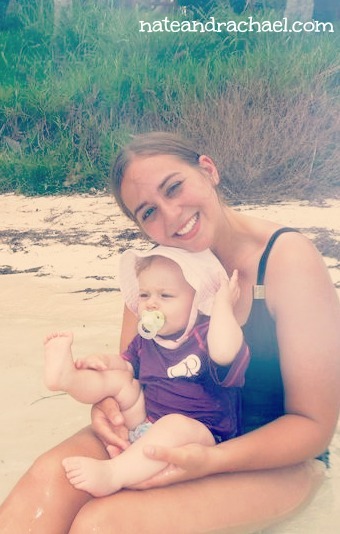 However, we’ve thoroughly enjoyed taking our babies (which I define as children under 18 months) to beaches in Florida, Mexico, Bermuda, California, Indiana (yes, there’s a beach in Indiana! ), Jamaica, and Puerto Rico. 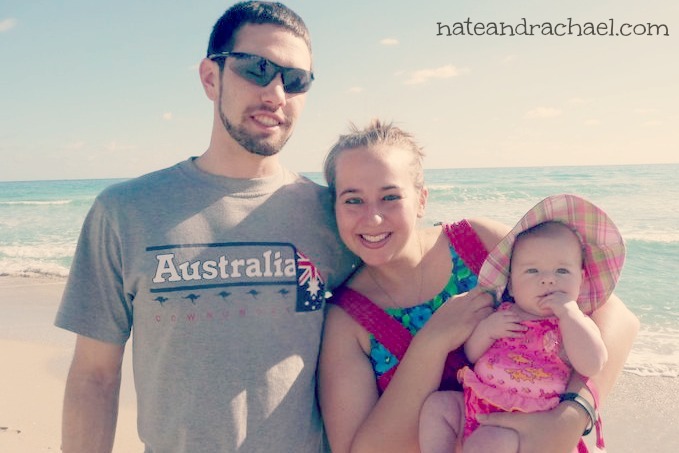 Our first beach trip with baby! December 2010. Protect your camera–I’m guessing this wasn’t the first tip you were expecting, but I consider it an essential one to pass along. We once ruined a camera from the sand at the beach. Of course you’ll want to take lots of pictures of your adorable baby at the beach, but learn from my mistake and be careful with your camera equipment. We keep our point and shoot in a waterproof case (like this one). Nate pointed out that it’s not wise to assume that a $10 piece of plastic will adequately protect a $100 camera, which is why we’ve never attempted actual underwater shots. However, it does offer adequate sand protection. Now that we have a DSLR, I’m even more scared of the sand. I once asked a photographer friend what she does, and she reminded me to use a lens filter, make sure my hands are clean/free of sand, and to keep equipment (e.g. extra lenses) in a well-sealed ziploc bag inside of my camera case. Of course, there are lots of other ways to hang on to those beach memories. Check out this easy and cute tutorial for instructions on how to make a beach-themed flag out of paint sticks or make a seashell collage like this one from Twodaloo. And because they won’t be little for long, these plaster of Paris hand prints are a great way to remember just how tiny your babies were during their first (second, third, fourth!) trip to the beach. Strollers vs baby carriers–when we travel, we wear our babies almost all of the time. But we’re also those crazy people you see trying (unsuccessfully) to roll their stroller through the sand. It’s not that our babies need a stroller; we need our trusty luggage cart! Snacks, towels, diapers, sunscreen, toys–it all goes on the stroller. We also have a sun/bug cover (this is the type we have) to go over the infant car seat should our little one fall asleep in her stroller or we go for a walk on the nearby pavement. Pitch a tent-on our most-recent trip to Jamaica, we borrowed a friend’s beach tent (here’s the exact one she loaned us). AND IT WAS AWESOME! Seriously, if you think there’s any chance your baby will nap on the beach and/or you want a sand-free place for your baby, rent/borrow/buy/steal a beach tent. Sun protection–you know the drill. Stay in the shade, wear hats, stay hydrated, wear rash guard swimsuits, avoid the peak hours of sunshine, use sunscreen. But what if your baby is under six months? Should you still use sunscreen? My friend Cindy at One Part Sunshine has a great blog post that addresses the “no sunscreen for babies under six months” issue. Swim diapers–I know some people hate disposable swim diapers, but beach newbies may not realize that regular diapers just aren’t able to absorb or contain the extreme wetness that comes with a dip in the ocean or pool. In fact, the gel packs will likely “explode” once they get completely saturated. We also like using reusable swim diapers! Back when we only had one child and extra room in our suitcases, we brought along our Bumbo. Excessive? Perhaps. 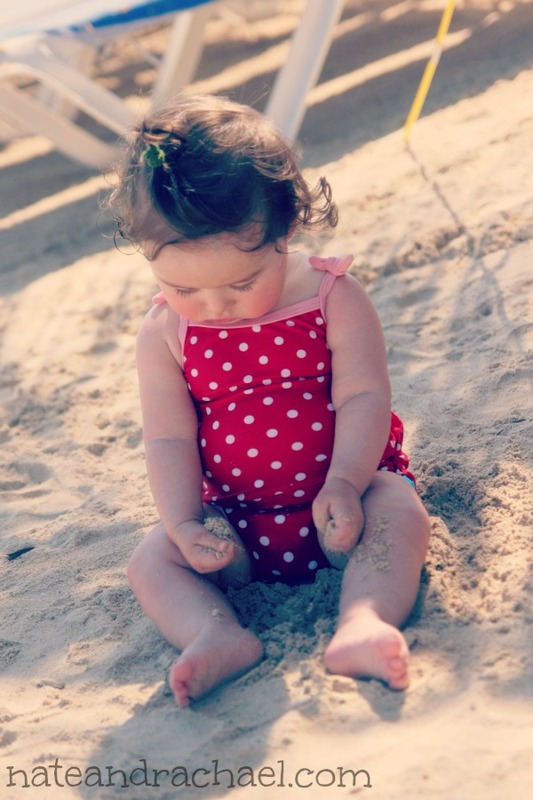 But it meant that our little one could sit “on” the sand without me worrying about the sand ending up in her mouth. More importantly, it was a great portable high chair to use for snacks and meals in our hotel room and on the beach. Bugs–a few beaches may have problems with gnats or flies. A small fan, your tent, or the scent of pure vanilla extract might help keep the pests away from your baby. For adults, I recently heard that drinking tonic water and dabbing on Absorbine are two ways to discourage bugs. I just purchased both from the drugstore, but we’ve yet to give them a try! Nursing moms— A beach towel is a great nursing cover in a pinch, but a lightweight swimsuit cover up is an even cooler option. Even if you nurse without a cover, you’ll still get hot in sun. Try to find some shade, bring a handheld fan, and chug some water. Collect seashells. Your infant might not yet appreciate the beauty of the seashells, but playing with shells is fun and great for fine motor skills. This post from Rainy Day Mum has fun shell ideas for babies to get you started. Don’t forget to bring a few shells home to dye (you can find instructions in this post at The Educators’ Spin on It) for even more sensory fun! Bucket, shovel, and water toys-there will be plenty of stimulation and activity for your baby even if you don’t bring a single toy. However, there’s no denying the potential for fun that comes with a simple bucket and shovel. Let your baby splash, dump, pour, and scoop to his heart’s content! On our last trip, instead of a bucket, my sister-in-law had the great idea to bring an old ice cream container. To make good use of space, we filled ours with baby food before packing it in our suitcase. Similarly, blow up toys (e.g. a deflated beach ball) and bath toys are well-suited for the beach and are a good use of precious luggage space. What to do with all of those toys at the end of the day? 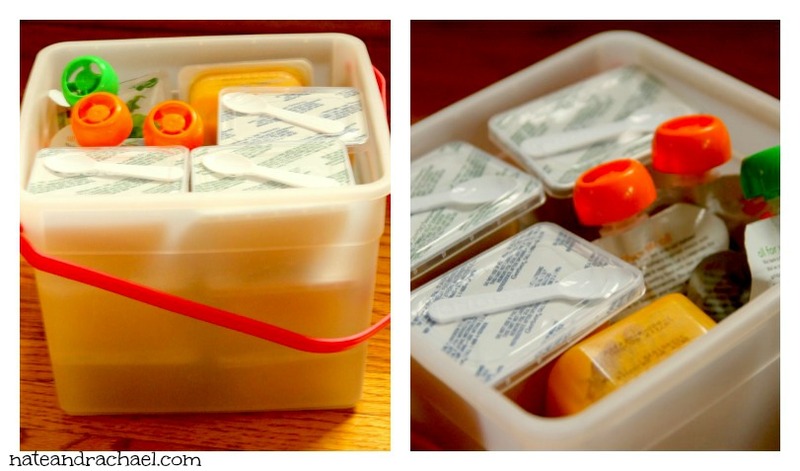 This post from The Idea Room will show you a cheap way to store and transport those sandy toys. 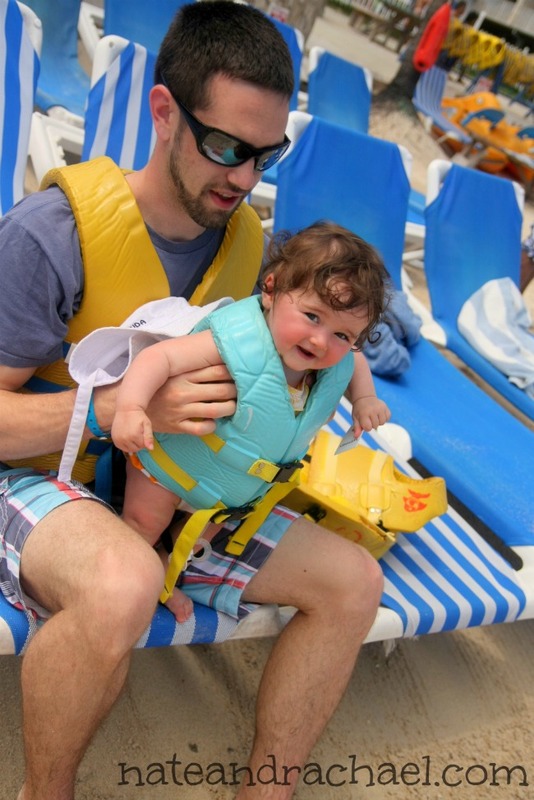 While taking your baby to the beach will be very different from your pre-parent days of sipping fruity drinks, reading beach lit, and working on your suntan, your vacation with your baby can still be the highlight of your year! Flying to your beach vacation? 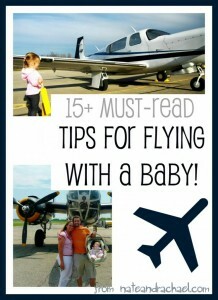 You MUST read our tips for flying with baby before you go! 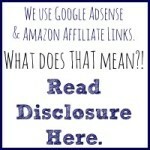 I assure you that there are tips in there that you’ve never heard before. 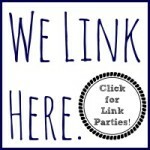 You can find this post at Tuesday Tots, Travel Tips Tuesday, and these other fun link parties! ← Healthy Chocolate Chip Cookies–with Avocado! Great ideas! I can’t wait to try these! Last time we went to the lake, I brought along a tin from my laundry detergent and the scoops that came with it and my daughter loved playing with them. Also, I highly recommend a swim diaper with velcro so it’s easier to change baby. What a brilliant collection of ideas. Love the tip about the cornstarch! Thank you. Don’t bother with reusable swim diapers unless you live at the beach. 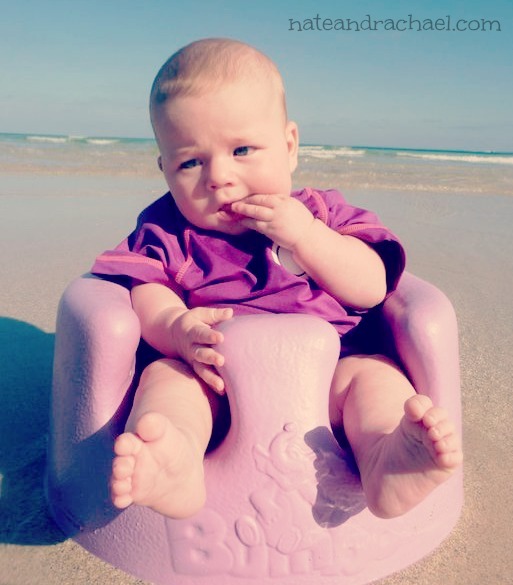 Swim diapers are only for keeping poop out of the water so unless you love spending your precious vacation moments trying to clean poop off of your baby, the diaper & yourself in the sand or some cramped public toilet, don’t do it! If there ever was a time for disposables this is it. Here is a good tip- you can reuse the disposable swim diaper if your baby only pees in it, why not? Just rinse it out, hang it up to dry & use the next day. Great tips! The beach is such a great sensory playground for babies. It’s so helpful to have these tips to enjoy it with little ones. Love your tips & ideas! The beach is great for young kids but we don’t want them to get burned at such a young age. Thanks for sharing at Discover & Explore this week – I’ll be featuring your post! Pingback: Tips for Traveling to SeaWorld with young kids and babies. Pingback: This "best beach" is nowhere near the ocean! Indiana Dunes.